Having successfully completed the Dubai Executive MBA programme this year, Chijyoti Challamarad and Anamika Gupta have plenty to celebrate. Graduation is a momentous occasion and a fitting end to every student's academic journey. 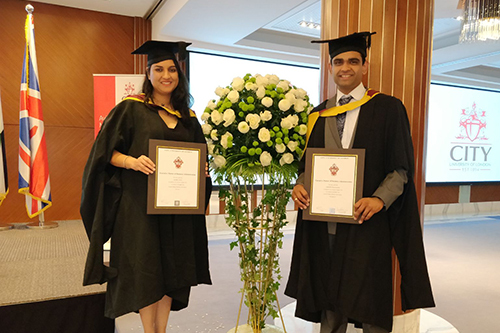 For City, University of London alumni Chijyoti Challamarad and Anamika Gupta (Executive MBA, 2018), graduation day was particularly special as the couple celebrated the culmination of their studies during the same ceremony. Chijyoti and Anamika donned their hats and gowns to join more than 40 students who took the stage to collect their degree certificates during City's ninth Dubai graduation ceremony. Anamika said: "Seeing each other on stage was incredible! We had a double celebration and felt proud of ourselves and each other's achievements." Driven by a desire to enhance their career prospects, acquire knowledge and new skills in the areas of business and management, and develop a strong professional network, the couple chose to enrol in the two-year Cass Executive MBA (EMBA) programme in Dubai, as they were of the view that "it would be a great experience to share together". Chijyoti said: "What attracted us the most to Cass Business School is its world-renowned reputation. Furthermore, the School offers a classroom-based EMBA programme delivered by professors who are leaders in their respective fields.The fact that we could pursue this degree without putting our careers on hold made Cass an obvious choice - our decision to enrol was reaffirmed when we had our screening interviews with Professor Roy Batchelor who was Course Director of the EMBA programme at the time. "Undertaking this degree together worked out well as we were able to partner up on several aspects of our studies such as assignments and exam preparations. Also, we really enjoyed having intellectual discussions on topics that were covered in our classes." While the couple admits that combining their rigorous academic schedules with their professional and personal lives was a constant juggling act, they were able to understand each other's limitations and support each other effectively. According to Anamika, the weekend classes remain a highlight of their EMBA journey. She said: "They offered a break from our daily routine and allowed us to interact with our professors and classmates in a relaxed setting. The friendships and memories made will always be cherished. So, was there an element of competition between the two of them while studying? "Not really," they point out. Anamika adds: "We have always been a team. However, with group projects, we would always ensure to be on separate teams, so there was definitely some competition there. Our classmates encouraged us to compete against each other in the classroom. Looking back, it's these fun experiences that we will certainly miss at City."